Surgeons may occasionally encounter difficulty in visualizing the whole larynx with a direct laryngoscope. In such cases, rigid endoscopic laryngosurgery using a direct laryngoscope is an optimal solution. 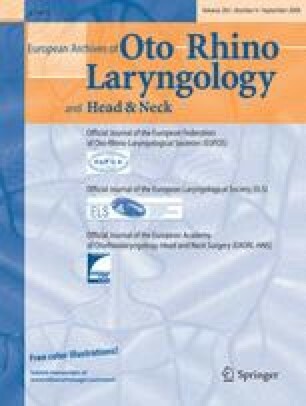 Multidirectional examination of the larynx using rigid endoscopes during direct laryngoscopy, leads to better control and management of the ventricle, inferior surface of the vocal fold and subglottis, and the anterior commissure. Currently, 0°, 30°, 70° and 120° angled rigid telescopes are used worldwide. Our experience in telescopic endolaryngeal surgery provided us the opportunity to work with AESOP 3000 (automated endoscope system for optimal positioning), coupling a robotic arm to a rigid endolaryngeal telescope. The use of this device allows the surgeon to control the field of view and operate with both hands. A total of 20 patients presenting a laryngeal lesion were randomly selected and included in this study undergoing a robot-assisted procedure. Three of 20 patients presented a difficult laryngeal exposure with direct laryngoscopy due to a rigid, short neck (1 male, 1 female) and prominent teeth (1 male). We used Karl Storz Hopkins II long rigid endoscopes having 0°, 30° and 70° direction of view, a Storz Xenon 300 cold light, a Storz Tricam SL camera, the Kleinsasser direct laryngoscope. The instruments we used are all commercially available for microlaryngeal surgery and included upward curved instruments in case of difficult laryngeal exposure. The operative equipment was the same for all procedures. We evaluated the acquisition of skills in controlling the AESOP 3000, the feasibility of a single surgeon performing procedures with this machine, and any advantages that it might offer to endolaryngeal surgery. The use of robotic devices improves the precision of surgical procedures, offering surgeons a more comfortable working position, particularly for longer procedures, and without an assistant to hold the camera.